Every entrepreneur knows that business growth is impossible without new leads (you may call them users, visitors, prospects, etc. depending on your industry, type of product or service). A big share of modern businesses render services and sell goods via websites. They include everything from simple online shops, one-page portfolio websites to complex SaaS portals and cloud applications. In any case, all these businesses have to attract new visitors to their websites using various approaches. Sooner or later standard traffic generation methods like online advertising, SEO, SMM will help you to hit the ceiling in your niche and you will have to explore new development opportunities. One of them is to expand your business to the foreign market. This can be achieved by translating your business into one of the most popular languages on the web. It is not a secret that English is the language of the internet. According to Wikipedia, 53.6% of all websites use English as the primary language. Most probably, if you are reading this website, your online business uses English as well. You might be surprised but the second most popular language on the web is the Russian language with 6.4% of content being written in Russian. Based on the number of users the Russian language takes the 7th place with the total of ~120M users worldwide. Therefore, if you want to conquer the new market you should definitely translate your business into Russian. This will bring you millions of new potential customers who could not use your product or service before. Based on marketing studies, 75% of customers prefer to buy products and services delivered in their native language. Let’s see how many new users you can potentially gain after translating your business into Russian. Russian internet segment is called RuNet. It covers not only the Russian Federation but all Russian-speaking CIS countries with the largest segments beyond Russia being Ukraine (~15M), Kazakhstan (~10M) and Belarus (~3.3M). The number of Russian-speaking internet users in Russia only is about 90 million people. Isn’t that great?! Now that you know the approximate size of the Russian online audience, we shall determine if your business needs translation at all. What kind of business may benefit from translation into Russian? Of course, translation into Russian is not a universal solution. Some types of businesses just don’t need translation since they are too specific for the foreign markets. However, there are many types of businesses that can be translated to amplify the inflow of users from Russian-speaking countries. The online shop is the first thing that comes to mind when thinking about translatable types of online business. Buying online becomes more and more popular. You can sell digital and physical products, clothes or gadgets to people from around the world. Translating your e-commerce site interface and product description into Russian will help you to attract Russian-speaking visitors from search engines. You can sell anything from cool T-shirts to Android games and apps – translation into Russian will make your products available for over 120 million people who could not use them before because of the language barrier. Cloud technologies become an integral part of our online activities. The so-called SaaS applications (software as a service) cover many spheres from marketing automation to customer management solutions. Translation into Russian can significantly increase your income as new subscribers will be able to use your platform in their native language. Today every modern company either producing some products or rendering services has a company website with information about its business. Translation of your company website into Russian will bring you thousands of potential customers through a web search. I’m sure there are many other types of businesses where translation can boost sales. 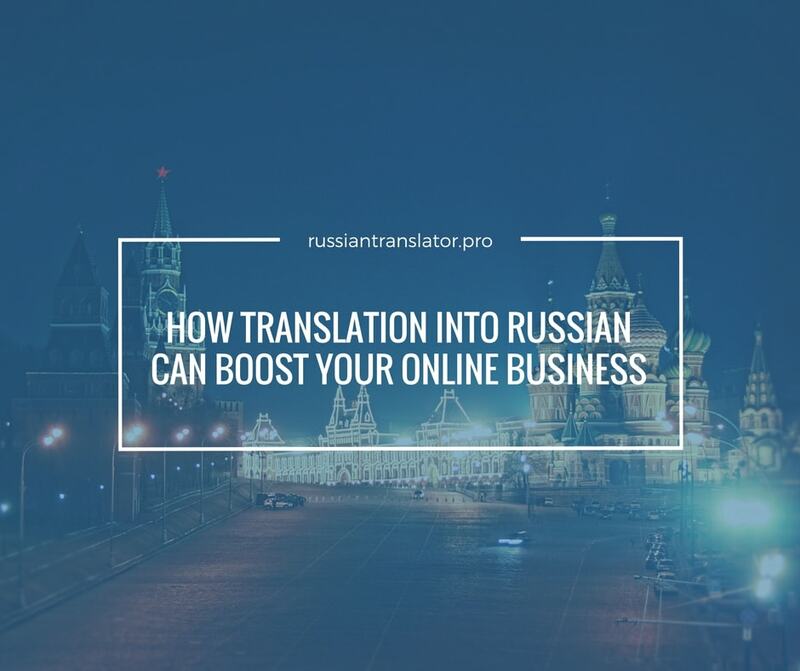 Translation into Russian can bring you over 120 million potential customers and if your business can be translated, do not miss a chance to conquer the Russian market before your competitors do that. Thinking about translation from this point of view, translation is not an expense, but an investment into your business development. If you need English-Russian translation for your document, website or application, contact me via email or by phone: +996 773 91 52 69 to get a free quote or order transition services.